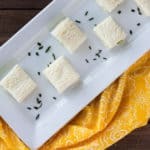 Spring gatherings are the perfect time to serve these Mini Cucumber Tea Sandwiches! PREP: You will want to set your cream cheese out ahead of time so that it can come to room temperature before you begin. Slice the cucumber into 10 1/4-inch slices, then in half. Mince the chives, basil. parsley, and garlic. In a small bowl, combine the cream cheese, minced herbs, and garlic. Smash everything together with a fork until it’s all well combined. Set aside. Slice the crust off of the slices of bread so that you have perfect squares. Then, cut the squares into quarters so that you have 4 equal pieces from each slice of bread. Spread the cream cheese mixture onto each of the slices of bread. Add a piece of cucumber, and top with another slice of bread.